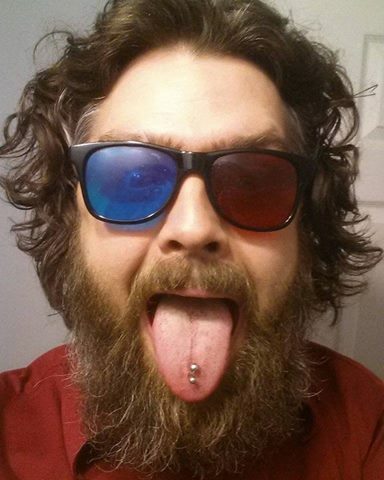 Let's be friends on Facebook! Get the Bar Buzz! We're right downtown, why aren't you down here yet? Try any of our signature burgers - The Manchester, Big Ben, Sir Alex, or Piccadilly Garden - served with our house cut fries, for only $9.99! Every Wednesday from 7pm to 9:30pm, quizmaster Francois Jacques of Mack Flash Entertainment hosts the most fun pub trivia night in the city! Free to play with teams of up to five people, win round prizes or the grand prize for the evening! Always a fun night! Pints of all Walkerville Brewery products are on special for only $5 every Wednesday, all day and night long! Every Thursday, buy one pound of our delicious chicken wings and receive a second order free, for only $13.99! This is a great opportunity to try out one of our 50 wing flavours, including 30 sauces and 20 dry rubs! 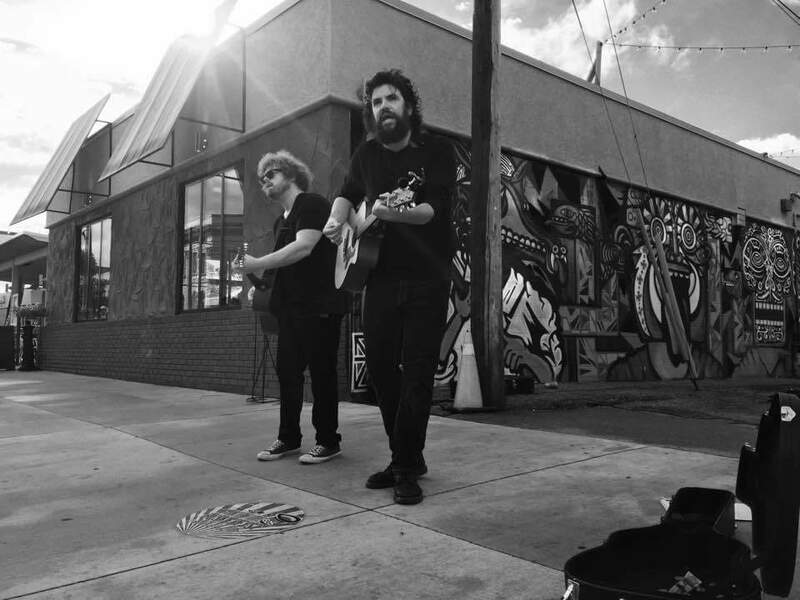 We've got weekly live music at 10pm! Our hand cut beer battered haddock, served with house cut fries and house made tartar and coleslaw, is available on special - Small 2pc. portion for $11.99 and Large 4pc. for $13.99! English Premier in the morning, NFL all day! Plus 2-for-1 Wings for $13.99 and $6 Caesars! Start your week of right with us! Our Classic Clubhouse sandwich is $11.99 with choice of side! $5 Tallboys of Steam Whistle Pilsner! Chelsea vs Burnley @ 3pm! Caps vs Canes @ 7pm, Preds vs Stars @ 8:30pm! Bucks vs Pistons @ 8pm and Rockets vs Jazz @ 10:30pm! 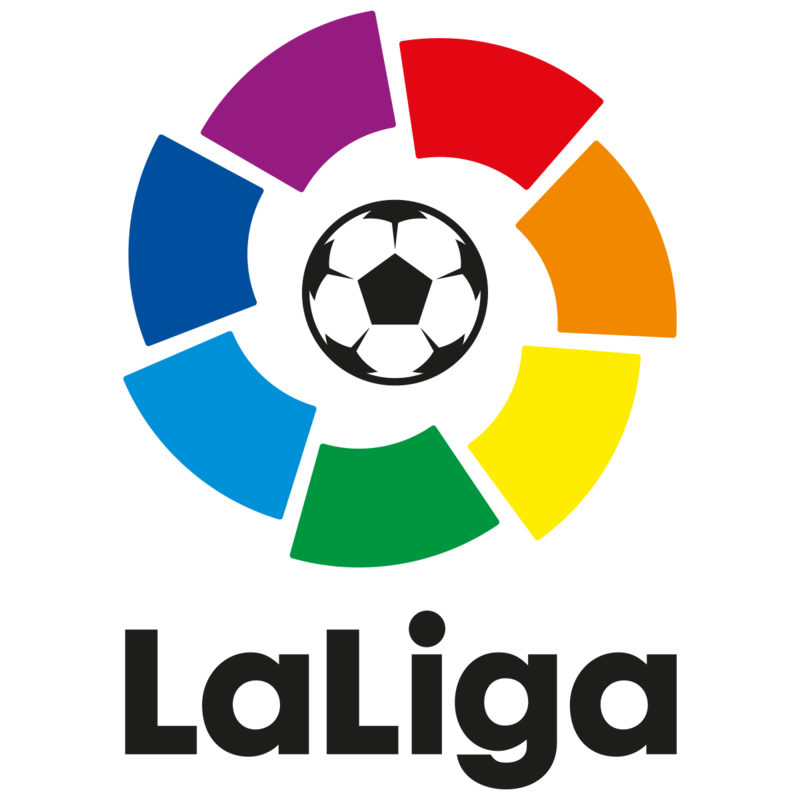 La Liga action today includes Getafe vs Atletico Madrid @ 12:30pm and Real Madrid vs Celta de Vigo @ 2:45pm! NHL playoffs continue tonight with Golden Knights vs Jets @ 7pm! 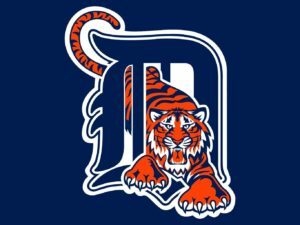 MLB schedule today includes Nationals vs Diamondbacks @ 4:05pm, Red Sox vs Jays @ 4:07pm and Mariners vs Tigers @ 4:10pm and 7:40pm! Finally, we have Andrew and Leigh rocking the Guinness Stage tonight! Walkerville Brewery and Mack Flash Entertainment present Pub Trivia! Our Pub Trivia, hosted by Francois Jacques, is live at 7pm, voted #1 Trivia Night in Windsor now FOUR years running in the Windsor Independent! 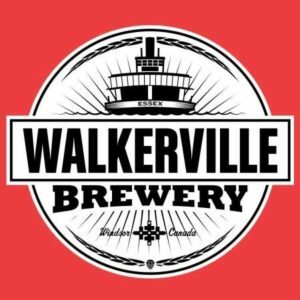 Pints of Walkerville are only $5 all day long! 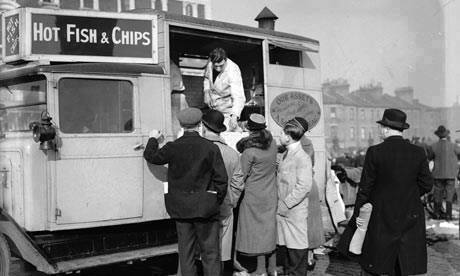 Its Fish N’ Chips Fryday! Beer battered and hand cut haddock fillets, served with house cut fries and house made tartar and coleslaw! Small portion for $11.99, large for $13.99! NHL schedule tonight includes Blues vs Blackhawks @ 8:30am and Stars vs Ducks @ 10pm! 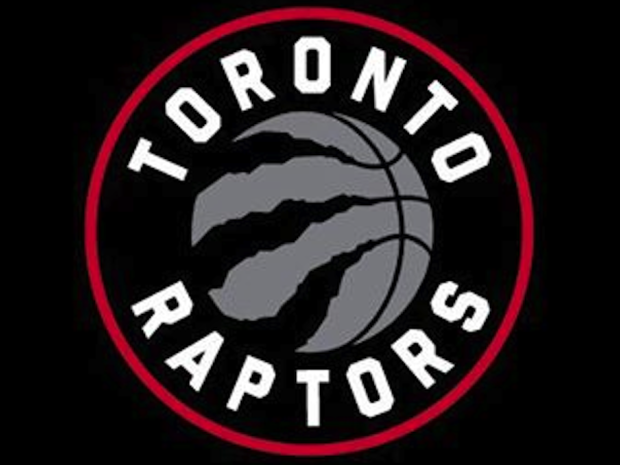 NBA schedule features Pacers vs Raptors @ 7:30pm and Timberwolves vs Lakers @ 10:30pm! 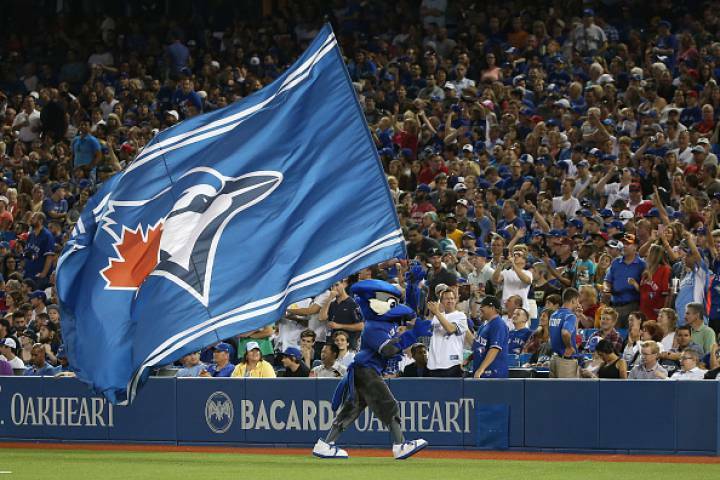 Baseball action today includes Jays vs Rangers @ 8pm and Dodgers vs Giants @ 10:15pm! 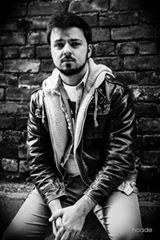 Finally, we have Bobby Sproat rocking the Guinness Stage tonight! 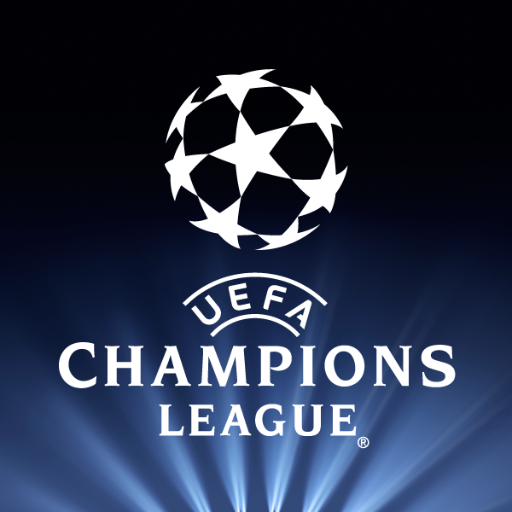 Champions League continues today with Liverpool vs Manchester City and Barcelona vs Roma both @ 2:45pm! 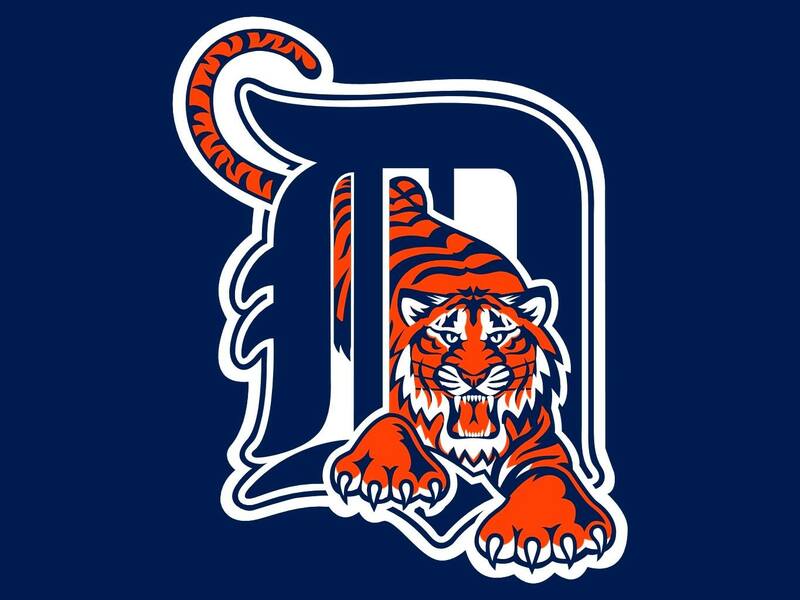 MLB schedule today includes Royals vs Tigers @ 1pm and White Sox vs Jays @ 7:07pm! NHL action tonight features Wild vs Ducks @ 10pm! 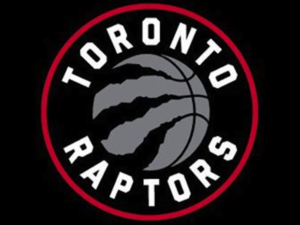 NBA schedule for tonight includes Celtics vs Raptors @ 8pm! The Barclay’s Premier League is winding down and the race to win the crown has never been tighter or more exciting! This week we have some mid-week replay games (to make up for previous postponements), meaning we have a full week of BPL action, including the always heated Manchester Derby on Tuesday, featuring Manchester United vs. Manchester City. Breakfast is still being served hot and ready every Saturday and Sunday beginning at 7am (served until 2pm). BPL Line-Up for March 29 & 30 – now showing Toronto FC! Here’s the listing of games we’re showing this weekend as part of BPL Breakfast. Doors open at 7am on Saturdays and Sundays and we feature a full breakfast menu from 7am to 2pm. Featured games are presented live and with full sound. And this weekend, due to popular demand, we are pleased to announce we’ll now be presenting Toronto FC games from MLS. The addition of English star Jermain Dafoe (ex-Tottenham), US star Michael Bradley (ex-Roma) and Brazilian keeper Julio Cesar (ex-Inter Milan), plus the return of Canadian football legend and former MLS MVP Dwayne De Rosario, has created a buzz around Toronto’s pro football team for the first time in years! Massive week of European football for all our footy fans! Here’s a listing of all the games we’ll be showing this week, including Champions League on Tuesday and Wednesday, Europa League on Thursday and Barclay’s Premier League on Saturday and Sunday – with a friendly reminder we are now open at 7am every Saturday and Sunday, so we show all early games, complete with a full breakfast menu available from 7am to 2pm! Please note that since North America changed it’s Daylight Savings time, we are now an extra hour off from European times! 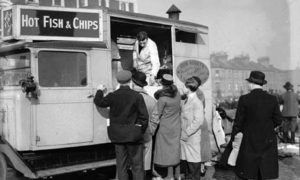 That time of year is here once more, where we celebrate the joyous culture and heritage of the Irish people – not only those who still reside on the Emerald Isle, but all those brave folk of Irish descendent who came to our great country and helped build Canada into the country it is today! 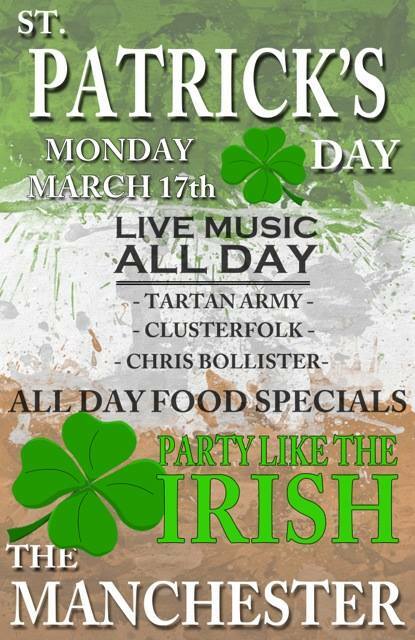 On Monday March 17th, we have a full day of Irish mirth and melody, from 11am right through until 2am. There is a modest $5 cover charge for the day, and we’ll have food specials all day long (or while supplies last) for our special limited St. Patrick’s Day menu – Corned Beef & Cabbage Sandwiches, Fish & Chips, Shepherd’s Fries, and Roasted Veggie Wrap. 11am to 3pm – TARTAN ARMY. Windsor’s premiere Celtic rock group has had them dancing in the aisles for decades! This kilted trio performs a great selection of contemporary East Coast folk with traditional Irish & Scottish sing-a-longs. 4pm to 8pm – CLUSTERFOLK. Former members of Celtic Cross, Clusterfolk have a stunning songbook, pairing all your Celtic favourites – from Ireland to Nova Scotia – with contemporary rock and folk, highlighted by the brilliant fiddle playing of Frank Edgley Jr.
9pm to close – CHRIS BOLLISTER. This Englishman was born to entertain on the Pub stage, with his witty banter, beautiful voice, and a songbook of your favourite classic rock and roll selections (with a few Celtic sing-a-longs to boot). 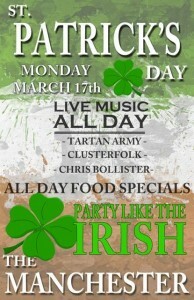 Please enjoy your day with us and by all means have a great time celebrating the Irish, but PLEASE ENJOY RESPONSIBLY. We would love to call you a taxi to get you home from your day with us – DON’T DRINK AND DRIVE! Barclays Premier League Breakfasts continue with some great action from both the BPL as well as FA Cup this coming weekend. Here’s the round-up of matches we’ll be showing on our tellies this weekend. A great chance to catch some brilliant footy action and try our new Breakfast Menu! The Chiefs stayed in control of the game until the last few minutes of the fourth quarter when Hixson put together a drive and went the duration of the field. The drive was capped off by a 1 yard run by qb Gill Brown Matt Ryan Jersey, Inserting Hixson ahead by a point. Hixson added a 2 point alterations, Making what developed into the final score 15 12..DeWitt Clinton Lipe held these simple offices, Clerk of Cooweescoowee section Senator August 5, 1877; Nation's Treasurer Nov. 11, 1879; Senator where he resigned and was elected member Cherokee Citizenship court Nov. 1886. Optimistic, His 2016 phone results 4,944 feets, 38 TDs and merely seven interceptions were MVP worthy cole beasley jersey. But Ryan never will be truly regarded until he gets the job done in the playoffs. Atlanta can be 1 4 with Ryan in the postseason, Impressive 85.2 passer rating in those five starts leaves a great deal to be desired.. On from tuesday charles sims jersey, March 22, Kennedy met with congressional leaders to go over his decision, Prior to addressing the media. Congress lobbied for a navy attack, While you are Kennedy stood firm Derek Carr jersey cheap, Stating that would not be the first plan. Obviously bothered by the cruel demeanor of those in the meeting, Kennedy realized this reaction was much like most of his advisors initial thoughts.